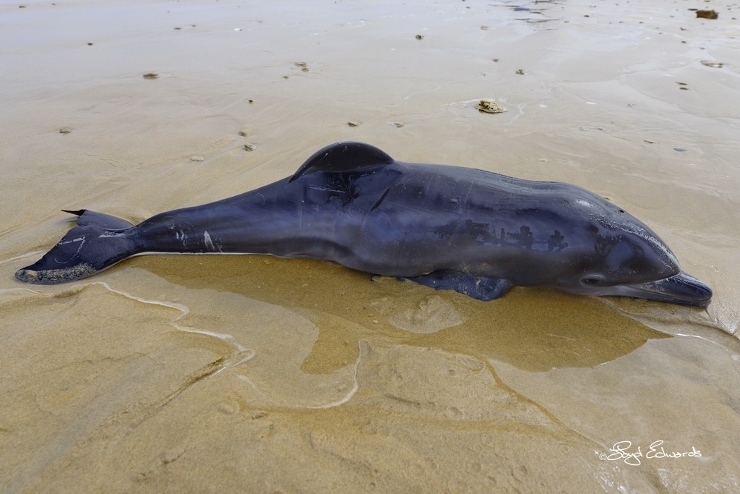 Stranded Bottlenose Calf A Result Of Dolphin Shooting? Raggy Charters’ resident scientist, Dr Lorien Pichegru has been conducting Beach Surveys for stranded seabirds since 2013. On the 30th September Raggy Charters made our vehicle available for the monthly survey. It was joined by Frikkie Van Der Vyver and Isabelle Callealta from the Bayworld marine mammal team. We found the following dead animals, 15 Cape Gannets, 10 African penguins and 4 Cape cormorants and a bottlenose dolphin calf which had been dead for a few days. 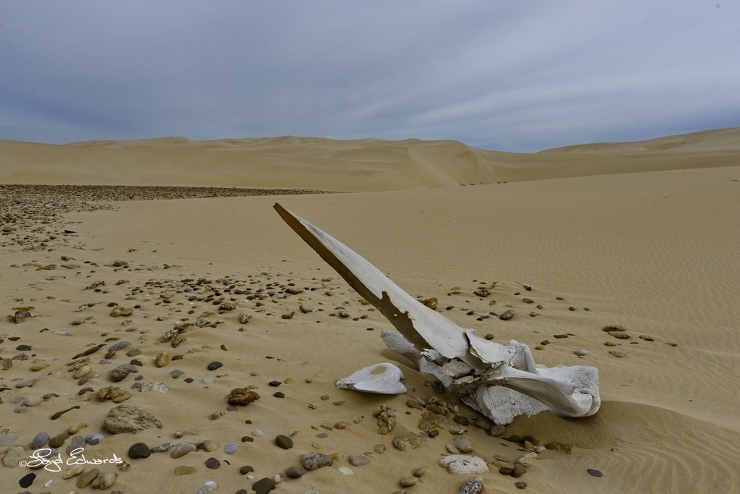 We found quite a few whale bones in the dunes. 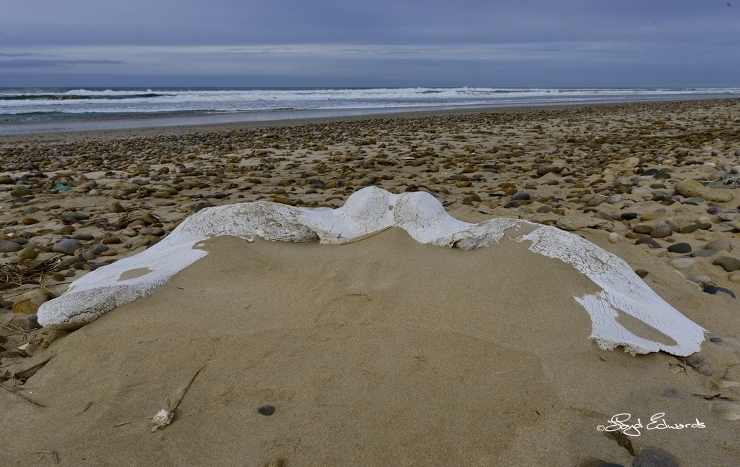 The large skull was from a Southern right whale and the smaller one from a humpback whale. Just as we were about to leave the beach, we noticed Kelp gulls picking at an object that was being washed in with the new high tide. On inspection we found it to be a living bottlenose dolphin calf, possibly just a few days old. As per the photo, the tail flukes were still slightly curved downwards, indicating that it was new born. The flukes normally straighten out after a few days. The dorsal fin was also still bent over, indicating a new born, although this can take around a week to straighten. Birth contraction marks can also be seen on the body. These can persist for up to a month. It was a very distressing sight. As the animal had no chance of surviving, the decision was taken to euthanize it. Two days prior to our discovery, a bottlenose dolphin was found stranded on Maitland’s beach. During a necropsy carried out at Bayworld, it was found that this animal had been shot. Prior to the shooting, the adult female had been in a healthy condition and was also lactating. This would indicate that she most likely had a calf at the time of her death. One wonders if the living calf that we found washed up on the Sunday’s surf was perhaps the offspring of the shot animal. Samples have been taken from both and analysis will be carried out to see if they are in fact related. So whoever committed the atrocity of shooting the adult female could now also possibly be responsible for another dolphin death. A case has been registered at the SAPS and it is being investigated. Two days prior to our discovery, a bottlenose dolphin was found stranded on Maitland’s beach. During a necropsy carried out at Bayworld, it was found that this animal had been shot. Prior to the shooting, the adult female had been in a healthy condition and was also lactating. This would indicate that she most likely had a calf at the time of her death. One wonders if the living calf that we found washed up on the Sunday’s surf was perhaps the offspring of the shot animal. Samples have been taken from both and analysis will be carried out to see if they are in fact related. So whoever committed the atrocity of shooting the adult female could now also possibly be responsible for another dolphin death. A case has been registered at the SAPS and it is being investigated. We will keep you updated! © Raggy Charters - 2019 | Links | Stranded Bottlenose Calf A Result Of Dolphin Shooting?